The Samsung Galaxy Tab A 10.5 is a middle-class tablet with a 10.5-inch full HD display, a Snapdragon 450 octa-core processor and Android 8.1 Oreo. Unlike most competitors in this price range, it features four speakers in total. According to Samsung, this tablet is aimed at families. That’s why they included a kids mode as well. Here is everything you need to know about the Samsung Galaxy Tab A 10.5. Like its two predecessors, the Samsung Galaxy Tab A 10.5 has a full plastic body. At the same time, it is quite thick with 8 millimeters. However, unlike most devices in this price range, it features four speakers. Because of that, it should be a great entertainment tablet. You can get it in black and grey. On the sides, we get a USB C port, a headphone jack, and a microSD card slot. The LTE 4G version has a SIM card slot as well. On the back, there is an 8-megapixel main camera with a LED flash. The webcam has a resolution of 5 megapixels. The Samsung Galaxy Tab A 10.5 has a 10.5-inch display with an aspect ratio of 16:10 and a full HD resolution of 1920 x 1200. Unlike higher-end tablets from Samsung, it is a standard IPS panel and not a Super AMOLED screen. The S Pen stylus is not supported. Let’s take a look at the internal hardware. Inside the Galaxy Tab A 10.5 runs a Qualcomm Snapdragon 450 octa-core SoC. In addition to that, we get 3GB of RAM and a 32GB eMMC flash storage. Other specs include Wi-Fi ac, Bluetooth 4.2 and optional GPS and 4G. The Samsung Galaxy Tab A 10.5 is shipped with Android 8.1 Oreo out of the box. So, as of now, that is a fairly recent version of Android. In fact, this tablet might belong to those that will be up to date the longest. Samsung has been quite good with updates in the past, much better than most competitors. Like usual, the Samsung Experience UI is running on top of Android. That is the own interface from the Korean company. Compared to TouchWiz, the previous versions, it has improved a lot. It does not seem overloaded anymore. I think most people will be happy with the software. While the Galaxy Tab A 10.5 has almost the same software as all Android devices from Samsung, it also has a special kids mode. It is marketed as a family device and has special software for families pre-installed. 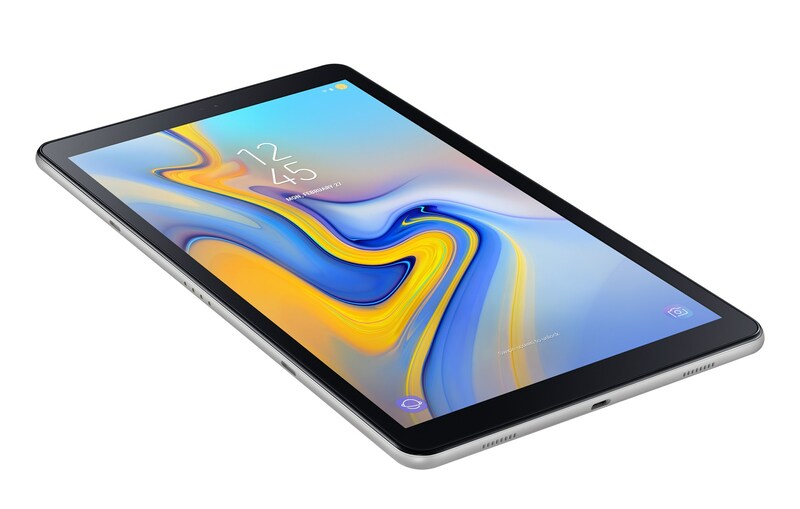 Samsung announced and released the Galaxy Tab A 10.5 in August 2018. It is available in the United States, Europe, and should be soon in Asian countries like India, Thailand, Taiwan, Korea, and Singapore. Prices start at 299 US Dollars or 329 Euros. There are tons of interesting alternatives to the Samsung Galaxy Tab A 10.5. A very interesting one is the Apple iPad 2018. While it offers two speakers only, it has a much higher-end build and supports the Apple Pencil. Depending on the market, it costs about the same or just a bit more. If you are looking for another similar priced Android tablet, you should check out the Huawei MediaPad M5 Lite 10. Like the Galaxy Tab A, it has four speakers but also a fingerprint scanner. Performance, display, and software are very similar. A noticeable higher-end Android tablet is the Samsung Galaxy Tab S4. It is much faster, has a much nicer display and supports the S Pen. However, it cost twice as much. Something much cheaper is the previous version, the Samsung Galaxy Tab A 10.1. However, I can only recommend it if you’re paying under 200 US Dollars for that two-year-old tablet. The Samsung Galaxy Tab A 10.5 offers a nice 10.5-inch full HD display, four good speakers, and an outstanding battery life. However, while the performance is good enough for most, it could be a bit better. And the facial recognition does not work precise enough. On the other hand, the Galaxy Tab A 10.5 might get updates much longer than its competition.